My mother spends some of her spare time on MSN Games and typically on the word games. But occasionally she branches out and today she decided to try MSN Dominos. Her PC runs Vista and she has a standard user account. I’m quickly summoned when she attempts to start the game, as Vista correctly prompts her for my credentials to install an ActiveX control. Although this being a tad annoying since Flash, Java, and the Games installer is already installed — I thought, why not? So with that typed in [click 1], up appears the expected Internet Explorer prompt wanting to install the MSN Games – Game Communicator. Okay, let’s go ahead and install that [click 2]. 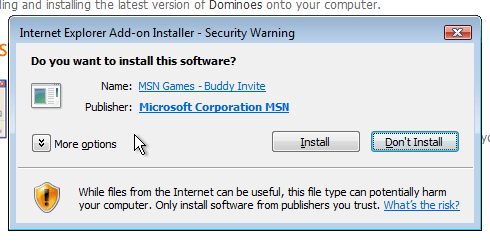 Great, it’s the MSN Games – Buddy Invite [click 5]. That’s just what I always wanted! Care to guess if the game will start now? Not again… Okay fine. I’ll type it in once more [click 6]. I’ve spared you the screenshot — This time it’s the MSN Games – Game Chat control. Install clicked [click 7]. I’m sorry, did someone test this at all? 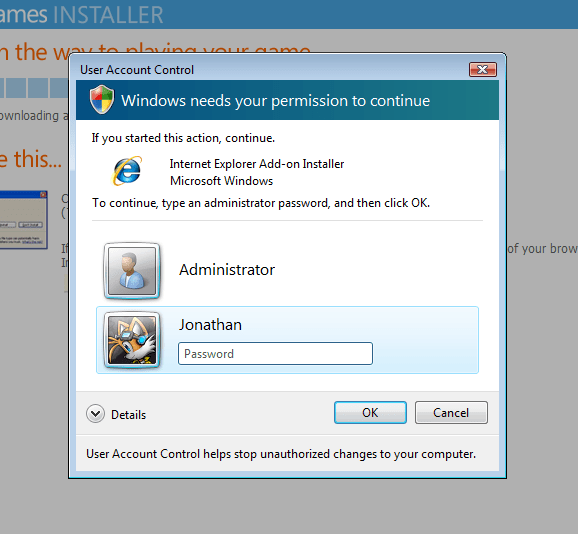 Even without Vista and UAC, you would still have to click install to all these dialogs. This time it’s the MSN Games – Matchmaking control. Now at this point my mother got up and left the room in frustration. Still, I’ll keep going. Install [click 8]. This one’s the MSN Games – Dominoes control [click 9 & 10]! Will I finally get to play the game now? I’ve just typed in my credentials 5 times and I’ve clicked install 5 times. At this point I’d rather just gone to my room and gotten my dominos set out. 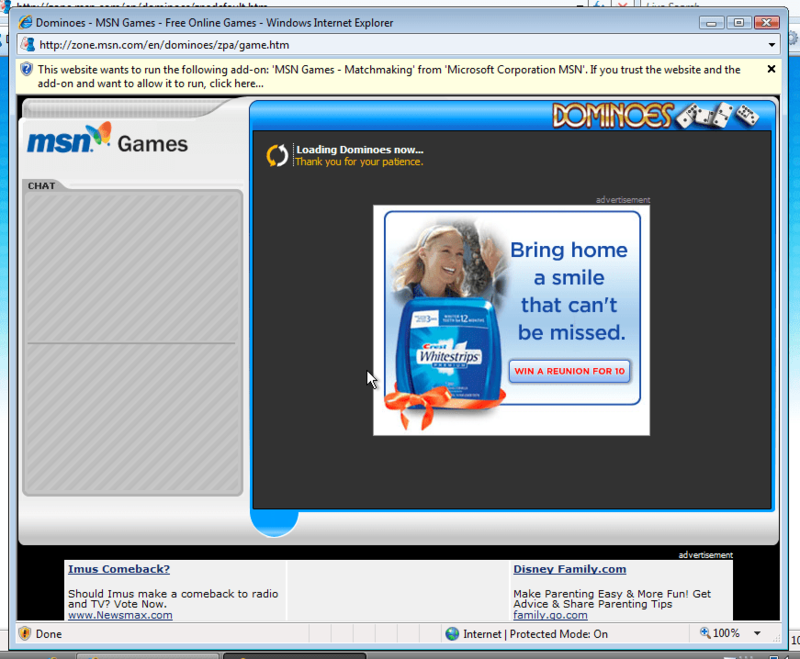 Now "the website" wants to run MSN Games – Matching control. 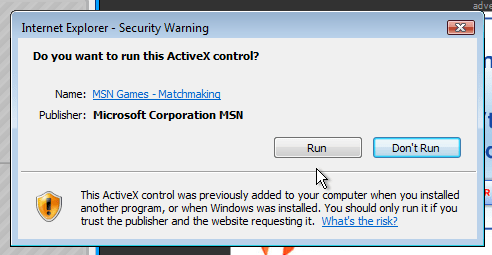 For those unfamiliar with the process, you have to click the bar and then click the Run ActiveX Control option [click 11 & 12]. Okay, done. Think we’re done yet? We’re not. And naturally the ads reload every time you do this. So after clicking the bar again, choosing to run the control and confirming it [click 14, 15, & 15], the MSN Games – Invite control was next with the same procedure [click 16, 17 & 18]. Oddly enough that was it, the game started — and here I was thinking the actual game was just clicking to install and run ActiveX controls! So it took many UAC screen flickers, a bit of frustration and 18 clicks to start this game. 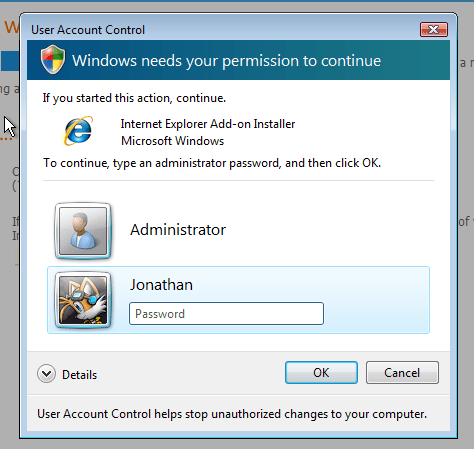 Although I had to actually type in my credentials those 5 times, I’m counting each UAC prompt as one click as Administrator users in Vista would just be able to click Allow. Unfortunately, that’s not all. While replaying this scenario in a VM for the screenshots I noticed you get two additional components on a clean install — the MSN Games – Installer [UAC click + install click + ActiveX run clicks = 5] and the Adobe Flash Player [UAC click + install click = 2], bringing the total to 25 clicks. This really isn’t acceptable, even if you weren’t running Vista. If it really needs components beyond the standard ones that most users have installed (aka Flash), then it should be one component. 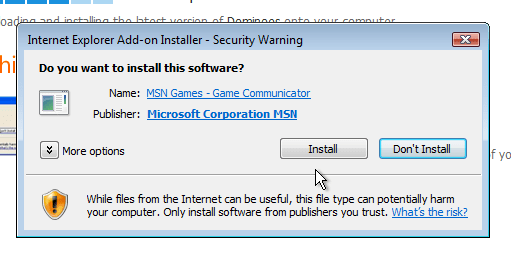 This so-called MSN Games – Installer component should automatically check for the latest version of the game, install it if its not done so, and then start the game automatically. One prompt, one click for confirmation and the game should start. After 25 clicks, the user has either given up like my mother (and she was just watching me) or is so tired of clicking these dialogs that they’ll play for a minute and then leave. This also undermines the whole security model as it’s just another reason for the user to grow tiresome of these prompts and won’t even bother to read them (if they are still anyway). Posted on November 23, 2007, in Uncategorized. Bookmark the permalink. 6 Comments. after the 25 clicks….it still won\’t run Active X. Now what??? ?